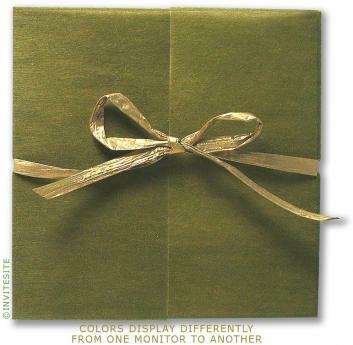 A handsome green and gold holiday party invitation -- perfect for business or personal holiday parties. Assembly Required. Easy to personalize and decorate. Great eco holiday invitation - 100% postconsumer recycled paper and envelope. Scored and die-cut gatefold wrapper for easy assembly. Translucent wrapper made from spun rayon. Closes with gold paper-rafia. Invitation made from 100% postconsumer cardstock -- antique husk colored. Matching husk recycled paper square envelope. Papers are made in the USA, wrapper paper spun in India. Finished invitation measures 6Â·1/4 x 6Â·1/4 inches. Invitation Sheet:6 1/8 100% postconsumer cardstock 105 lb. Wrapper:Rich green spun rayon - diecut and scored. Mailing Envelope:Matching 70 lb 100% postconsumer square envelope.